Harlem We are used to the fact that Brazilian jazz musicians are great at playing bossa nova, not to mention samba – a purely Brazilian phenomenon. We are used to the fact that American jazz musicians are eager to turn to the Brazilian musical heritage, from Wall Goetz and Charlie Byrd to our days, also creating beautiful examples of true creativity. But for them it is, in any case, a view “from North to South”, a look at Brazil from the United States. The album presented today is unique in its own way: it is a view from the South to the North, a look at the USA from Brazil. It is not accidental, it has the characteristic name “Harlem”. 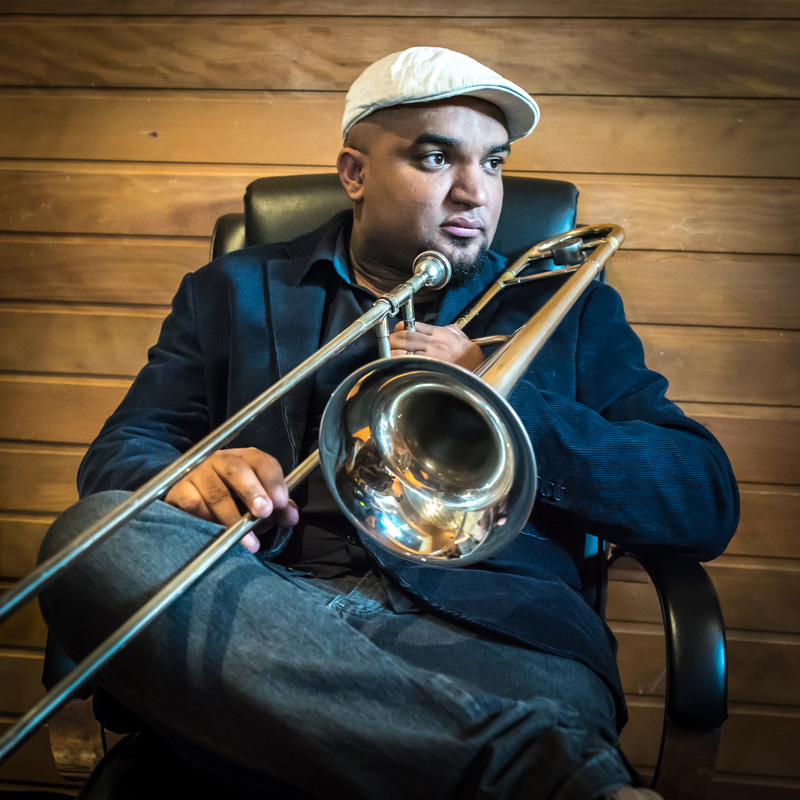 Trombonist Jorginho Neto, a representative of a new generation in Brazilian jazz, started playing the trombone at age 13, speaking at the church. At age 22, he successfully graduated from Tom Jobim University and became a welcome guest in many Brazilian bands and orchestras. For today in his own discography there are two albums: Samba Jazz (2012) and Leste (2015). Ensemble Jorginho Neto Collective, he founded in 2015 and with this band recorded his third album Harlem. This project is significantly different from previous works of Neto. There is practically nothing specifically Brazilian here. It is completely solved within the framework of American jazz idioms. But the language of American jazz has developed many different “dialects”, Neto in his new album chose the funk language of the early 70’s and addresses precisely this period of history. This is evidenced by a kind of musical epigraph – the starting Preludio, where Jorginho combined the theme of the famous Amazing Grace anthem with the speech of Martin Luther King. And then there are seven more tracks (one by pianist Gustavo Bagni and guest guitarist Alejandro Mihanovic, the rest written by Jorzinho Neto himself), which make us remember the times of Head Hunters of Herbie Hancock. The tough groove created by the rhythm group serves as the basis for the solo parts of the main frontmen of the group – Neto himself and trumpeter Sidmar Vieira. Typical for the album is the title play, where, after the solo of Vieira, Neto enters, then the pianist and bassist join in, and again the wind comes out on the front stage. A similar scenario unfolds a musical performance in such impressive compositions as Mr Dave, Liberty, Weather Hunter (a symptomatic mix in the title of the play of the legendary Weather Report and Head Hunters) and the final Lord. Sometimes, against the background of the same funky rhythm, Neto and Vieira doubled the voices of their instruments, then again bred them, seeking more expressiveness. And they succeed! The album is easy to listen to, and the style of the game, unusual for Brazilian musicians, is pleasant, not only to listeners, but to themselves. I think that listeners from different countries will be interested in this Brazilian version of funk-fusion, well, and Americans will be especially curious to look at this musical mirror, delivered to them from the Latin South.